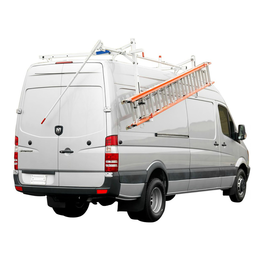 No more climbing your van before you climb your ladders. With just a twist of a lever, the EZ-GLIDE™ System delivers your ladder to the right spot for back-saving loading and unloading. And when the work is done, another twist is all it takes to have the ladder packed away and ready to roll. 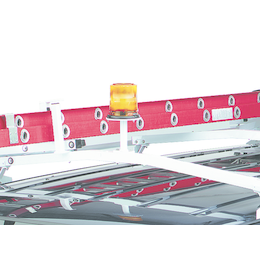 The quickest, easiest and safest drop-down ladder rack system available, the EZ-GLIDE System also has a long-lasting aluminum frame design and interlocking supports that ensure your ladders stay in place when stowed. provides a smooth, quiet, and effortless descent. 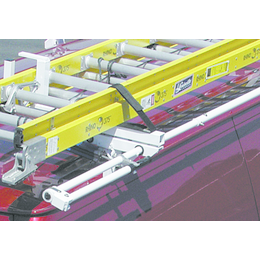 The essential EZ-GLIDE™ System rack comes with a drop-down system on the passenger side and a standard ladder rack on the driver's side. Maximum ladder weight of 75 lbs. per drop-down assembly. 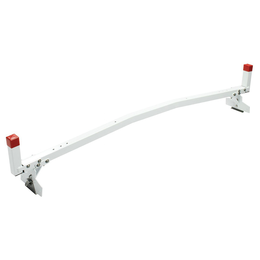 251-3-02 For Ford Vans - Mounts to rain gutters 62 lbs. 252-3-02 For GM Vans - Mounts to rain gutters 62 lbs. 253 For Compact Size Vans - Bolts through the roof 67 lbs. 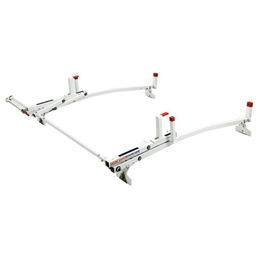 The driver's side drop-down kit is universal and fits the EZ-GLIDE™ System racks by unbolting the driver side end posts and bolting the kit in place. Maximum ladder weight of 75 lbs. per drop-down assembly. 255 For Ford Full Size Vans - Fits models 251-3-02, 252-3-02, 253 45 lbs. 286-3-01 Fits model 280-03-01, 262-3-02 63 lbs. 287-3-01 Fits model 285-3-01, 261-1-02 54 lbs. 254 Fits models 251-3-02, 252-3-02, 253 14 lbs. 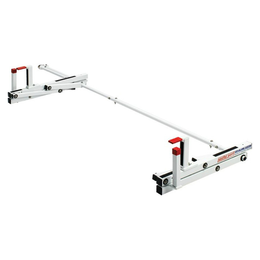 For use when your van length or load requirements require a cross member. 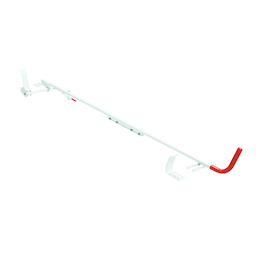 Each of our cross members are vehicle specific and attach easily to any of our Full-size van or Minivan racks. 2511 Fits model 251-3-02 14 lbs. 2521 Fits model 252-3-02 14 lbs. 2531 Fits model 253 13 lbs. 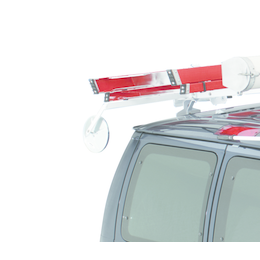 These unique racks utilize the same professional-grade EZ-GLIDE™ System as our Full-size van and Minivan models, with added features designed specifically for Sprinter vans. An added slide down system lowers the ladder an additional 2 ft. after the drop-down rotation. 280 EZ-GLIDE® System High Roof Sprinter 2003-2006 80 lbs. 280-3-01 EZ-GLIDE® System Sprinter High Roof 2007 & Newer - Passenger side. Includes rear slide down system 80 lbs. 285 EZ-GLIDE® System Standard Roof Sprinter 70 lbs. - Passenger side. DOES NOT include rear slide down system 70 lbs. 286-3-01 EZ-GLIDE® System Sprinter High Roof DS Kit 2003-2007+ 63 lbs. 287-3-01 EZ-GLIDE™ System Sprinter Standard Roof DS 2003–2007+ 54 lbs. 261-3-02 For Nissan NV standard roof, passenger side. DOES NOT include rear slide down system. Mounts to roof brackets 85 lbs. 262-3-02 For Nissan NV high roof, passenger side. Includes rear slide down system. Mounts to roof brackets 95 lbs. 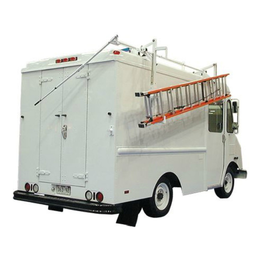 Engineered for 8' and 10' high Cube vans with flat roofs. 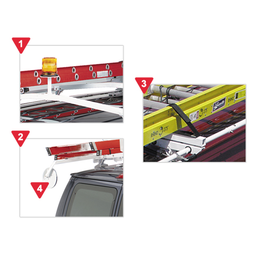 These racks feature the same drop-down system that lowers the ladder to an easy to reach position for easy loading and unloading. An added slide down system on the 10' high Cube Racks lowers the ladder an additional 2 ft. after the drop-down rotation. 281 For 8' high Cube vans passenger side 66 lbs. 283 For 8' high Cube vans driver side 66 lbs. 282 For 10' high Cube vans passenger side. Includes rear slide down system 75 lbs. 284 For 10' high Cube vans driver side.